These two photographs are of a baseball game in progress at an early Topeka ballpark. The ballpark was built in 1904 in the Dudley Tract, in the vicinity of the current intersection of 15th and Adams. The park was initially constructed for use by the city's minor league entry in the Class C Missouri Valley League. 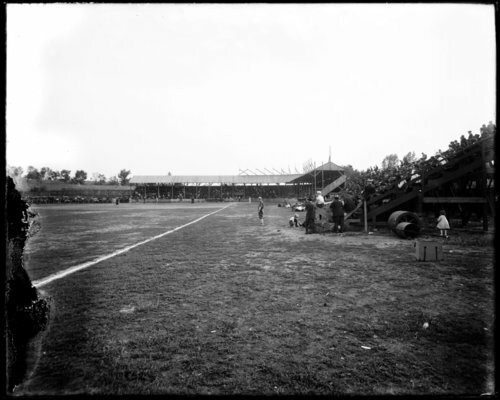 The inaugural game was played on July 24, 1904 in a league contest against Leavenworth. In the years to follow, the park was used by minor league teams participating in the Western Association (1905-08, 1924), Western League (1909-16, 1918), and Southwestern League (1922-23, 1925-26). During the years the ballpark was used by minor league teams, it was often referred to by the name of the league the team belonged to, ie League Park, Association Park, Western League Park, Western Association Park, etc. The ballpark also was used by other teams in the city. These photographs were produced from glass negatives believed to have been made between 1912 and 1920. These two photographs are of a baseball game in progress at an early Topeka ballpark. The ballpark was built in 1904 in the Dudley Tract, in the vicinity of the current intersection of 15th and Adams. The park was initially constructed for use by the city's minor league entry in the Class C Missouri Valley League. The inaugural game was played on July 24, 1904 in a league contest against Leavenworth. In the years to follow, the park was used by minor league teams participating in the Western Association (1905-08, 1924), Western League (1909-16, 1918), and Southwestern League (1922-23, 1925-26). During the years the ballpark was used by minor league teams, it was often referred to by the name of the league the team belonged to, ie League Park, Association Park, Western League Park, Western Association Park, etc. The ballpark also was used by other teams in the city. These photographs were produced from glass negatives believed to have been made between 1912 and 1920.